Salame de Chocolate is one of the best chocolate treats in Portuguese dessert making. It combines the sweet and unique flavors of Maria cookies and cocoa to make an unbelievably tasty treat that can be enjoyed at any time of the day, especially for those with a sweet tooth like myself. This recipe is very popular in Portugal because it is just so simple and easy to make and can be stored away for just about any occasion. It is perfect for serving alongside some coffee or tea. Try it out and tell us what you think! 1) On a baking sheet, toast the slivered almonds and pistachios in a preheated oven at 350 degrees Fahrenheit. Bake until the nuts are lightly toasted, for about 10 minutes. Remove from the oven and set aside in a bowl. 2) Add the butter, chocolate chips, sugar, cocoa, and eggs to a saucepan on medium heat and stir it well. Let it cook for 3-5 minutes until it reaches a smooth and even consistency. 3) Pour the chocolate mixture into the bowl with the slivered almonds and pistachios. Stir all the contents together well with a spoon until the mixture reaches a smooth and even consistency. 4) Break the cookies apart into smaller pieces about the size of thirds and add them to the rest of the mix. Stir it all together well. Place this mixture in the refrigerator for about 15-20 minutes until it is a little more hardened but still able to be molded. 5) Now place the chocolate mixture onto the wax paper and form it into a cylinder shape. 6) Roll the wax paper close around the mixture and twist the ends. Roll the log on an even surface until it takes the form of salami. 7) Place in the refrigerator for at least 3-4 hours. 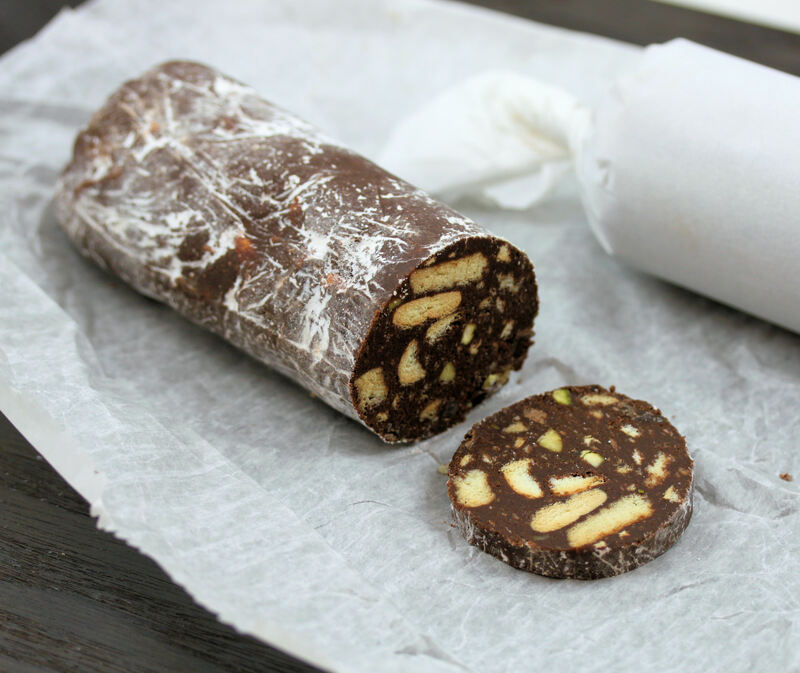 8) Remove from the refrigerator and unwrap the chocolate salami from the wax paper. Now dust the wax paper with the confectioner’s sugar and roll the salami around in the wax paper to coat it. Wrap the salami up again in wax paper and place in the refrigerator. 9) When ready to serve remove from the refrigerator and slice off pieces as needed. Can this chocolate salami be frozen? Yes it can, the chocolate salami is best kept in the freezer for long periods of time to preserve the flavor. Maria cookies are a very popular type of wheat cookie in Portugal and Spain, they are known as called “Bolacha Maria”. You can easily buy them here on Amazon if you can’t find them locally. Check the goya products at your local super market, found it 2 for 1.00 😉 love this stuff my mother use to make it for the holidays. I live in Portugal where Maria biscuits are cheap and plentiful. For anyone not in Portugal or Spain, something like a Rich Tea is basically the same or even a digestive. The kind of biscuit really isn’t crucial. I’ve made this about 4 or 5 times now and I melt the sugar with the butter as otherwise it is raw sugar mixed in and gives a really grainy texture. I’ve played with the recipe and added things like big spoonfuls of nutella or melted a handful of milk chocolate to the mix to make it even richer. They also sell a version with chopped almonds in here. I’m making about half a dozen at the end of the month to slice and sell at our village festa. Yes Rich Tea they’re great and very similar. I find very interesting the fact you’re doing them, and sharing or sell on your village festa . English supermarkets have tones of biscuits and cookies but nothing like our salame de chocolate. Im so happy I found this recipe,I had lost it. Love this deserves. You can find Maria cookies at any Latin supermaket. They are very popular in Mexico. This is basically a brownie mixture with added crushed cookies. I have had it several times in Portugal, but to me, it’s overrated and too sweet and I’d rather than a gorgeous, warm brownie made with cocoa for an earthy, deep chocolate flavour – slightly cakey outside and meltingly soft within. Like all sweets, if you have grown up with it, you remember it and prize it. But it really isn’t worth the bother unless, as one of the respondents mentions, you are making several and selling slices. I realize this thread is a few years old, but I just had to respond to some of these comments. No disrespect for what some others have said, but I feel the need to offer my experience and differing point of view, to save others the disappointment of ordering something based on these comments, and then not being happy with the taste. I fell in love with Maria cookies while in Florida, as a comfort food cookie eaten straight from the package. They are just the right amount of crispy, not too sweet, with a hint of vanilla. They have a clean, home-made flavour – with no chemical aftertaste that I find in many mass-market products. However, I spend my summers in Regina, Canada where Maria cookies are very difficult to find. To Tatiana who said they are the same as milk biscuits, (and to Keren Pugh who said the same for Rich Tea Biscuits and Digestives), trust me; I have had them all and while they may be similar, the taste is not the same as Maria cookies at all. Similarly, all brands do not taste the same. My favourite is actually the Iberia brand for eating out of hand. Goya brand are just OK, and Gullon brand are tasteless compared to the others – much like the no-name brand from Superstore that I can buy here. Cuetera brand comes from Spain, where these cookies originated, so I would try them if I could get them; unfortunately they don’t ship to Canada. To Henry, who said just to buy them at your local Portuguese market; you have to realize that not every city, or even every country, will have a Portuguese market. Yes, they are much more expensive to buy from Amazon than at your local grocers (Iberia are 97 cents per large roll in Florida), but for those of us without access to international markets, well, it’s a choice between the yucky tasteless no-name ones for cheap, or order from Amazon to get the ones we want. Having said that, I agree with Keren Pugh who said that if you are using them in a recipe such as this one, it probably won’t matter which ones you use, as they are only one small part of the taste. But for eating out of hand as the ultimate comfort food snack, everyone will have their own favourite brand, but please don’t try to say they are all the same, as they are really not. Dawn, thank you so much for taking the time share your wonderful thoughts & experiences on this. For anyone who is interested in purchasing these types of cookies this is very helpful in helping discern between those of varying qualities and options of purchase.